Fat Girl to Thin: What Day Is It Again???? What Day Is It Again???? Now that my schedule has changed to Tuesday thru Saturday I officially have no earthly idea what day of the week it is. I got up this morning and went to the gym (like I try to do everyday, we will address this in a minute) and as I sit here at Starbucks it just occurred to me that today is Thursday and I am officially 2 days away from the beach! Go ahead and get your jealousy ready because thats how I felt all summer long when you posted pics of your beach vacation. I am looking so forward to my trip and I don't even care that my bathing suit fits like a tourniquet I'm gonna wear it like I'm freaking Keri Walsh and play and swim all day. Im so looking forward to some time off, a small break, and just some chill time! The last 2 months have been big adjustments with starting school and going back to CrossFit as well as trying to spend time with my family (which you know is super important to me) Sometimes I have to see them late at night but I definitely have to get that time in where I can. Now this week should have been crunch week at the gym since Im going to be in my bathing suit but I didn't figure I could lose 100 pounds before I left so I just treated it like any other week. I actually have done a terrible job of getting to the gym this week. Actually, I have done a terrible job just waking up this week. For example, yesterday I woke up at 8:08am and I have to be at school at 9am. It was a remarkable morning because I got up and showered and made it to school just a few minutes late. I live 45 minutes away from school, thats a valuable piece of info for that last sentence. I also managed to run (literally) out of my house without my cell phone and I challenge any of you to give that a shot now that you are used to having it every day. I felt naked not being able to check it. When I finally got home I had 2 missed calls and 38 text messages. Im not that popular of a person and probably don't get that many text in 3 days! Once I got home yesterday I thought things were back to normal, I had my phone and I was off to the gym to swim with my swimming buddy (who on a side note did a great job last night, especially since the last time we swam she cried and I got mad) and then off to choir practice. It wasn't until I sat down at choir for 30 minutes that I realized that since I wasn't going to be there Sunday then I probably didn't need to stay for practice. OH MY how stupid can one person get!?!?!? DONT ANSWER THAT! I left practice and then headed home. Once I had my phone I got my most favorite text message..."I made taco bake, come on over and eat with us." There are no more sweeter words, someone made dinner and gave me some so I didn't have to cook dinner. And it was the first time since last week that I have gotten to eat something crunchy due to a cracked tooth that I got fixed on Monday. That will make a good taco bake a GREAT taco bake. Im finally at Starbucks, first time this week! That is just entirely too long to go without my morning coffee or blogging. And I got a wonderful little happy yesterday. 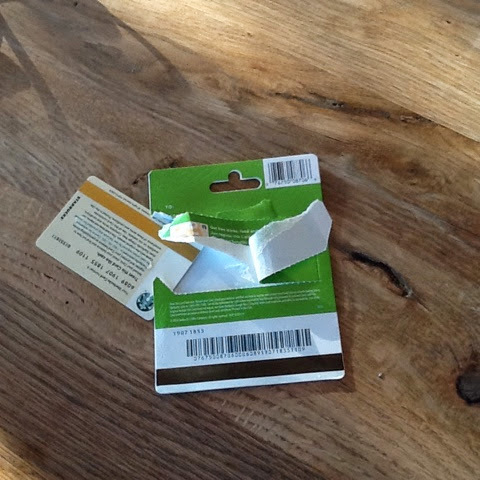 Some girl at school came to me and gave me a gift card to Starbucks. When I asked her what it was for she said that she read my blog and thought I could use it....so thank you so very very much, I couldn't get to it quicker!